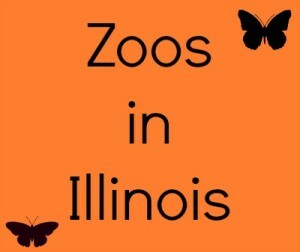 Here is a list of zoos in Illinois. We have been to a few and enjoyed them. Hope you will too. Brookfield Zoo – This zoo is in Brookfield, IL, 14 mile west of downtown Chicago. They are open 365 days a year, 10:00-5:00 Monday-Friday and 10:00-6:00 Saturday & Sunday. There is a fee for general admission and parking. They have quite a few fun attractions like Stingray Bay, Dolphin Discovery and Butterflies. These attractions open on different dates so be sure to check out their website for more information. They also have a variety of events throughout the year. Celebrate Mother’s Day with a Mother’s Day brunch or Father’s Day with a BBQ. There is something for everyone! Lincoln Park – This zoo is in Chicago, IL just minutes from downtown. Zoos are not only for kids. Lincoln Park zoo has adult activities like gardening classes and adult yoga. And don’t miss the zoo attractions like the carousel and the children’s train ride. There are all kinds of exhibits: Polar Bear and Penguin Habitats, Farm in the Zoo, Sea Lion pool and lots more. The Milwaukee Zoo in Wisconsin is not too far and is a great zoo to go to. We really enjoyed it when we went. It’s been quite a few years since we’ve been there though but I can only imagine it’s gotten better. And just recently I heard about The Cosley Zoo in Wheaton, IL. Fox Chicago News shared a bit about this zoo on their Facebook page this month. Check out the cuties in this video. On their website, it says they maintain 20 exhibits, that house more than 150 animals. They even have a few baby lambs. We want to take our granddaughter here for a mini day trip. Kids are free. They also do a 5/10 k run and kids run to raise funds for the zoo. Head over to like the Cosley Zoo on Facebook. Do you have any zoos that you recommend where you live? You know I never realized how many zoos there are, especially in the United States. Since I have no pets, I love going to the zoo, or a farm, or best a petting zoo!